Let start the tutorial how to use angular js with canvasJS charts. Find the folder structure of the project below. underscore.js used for grouping and bootstrap for layout design. Find all library files under lib folder(angular, canvas, underscore) and bootstrap in css folder. 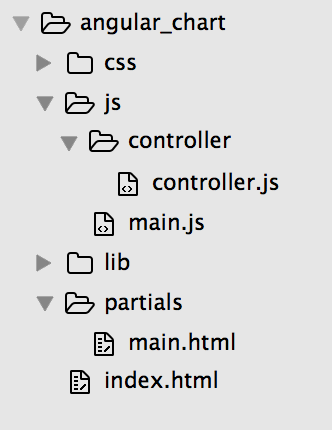 Create main.js under js folder. Copy past the below code. Here for data I have used the “iTune top paid app” free api services.